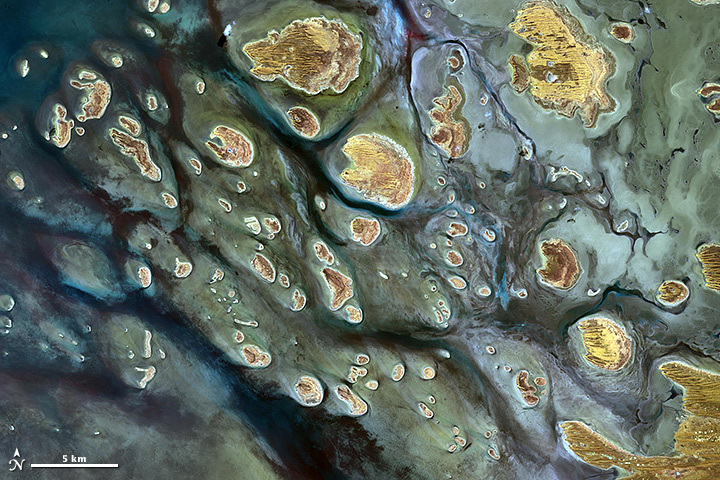 Hundreds of salt lakes are sprinkled across the landscape of northern and western Australia. Most, including Lake Mackay, fill infrequently via seasonal rainfall that runs off of nearby lands and through minor drainage channels. Lake Mackay is Australia’s fourth largest lake—encompassing 4,737 square kilometers (1,829 square miles) along the border between Western Australia and Northern Territory. The image above, acquired on September 19, 2010, by the Advanced Spaceborne Thermal Emission and Reflection Radiometer (ASTER) on NASA’s Terra satellite, shows about a quarter of the lake area. Dark areas indicate desert vegetation or algae, moisture within the soils, and the low elevations where water pools. Light browns indicate areas of higher elevation that occasionally form islands. So, how deep is the water? That depends on when you measure. When full, some of the deeper lakes in the region can be several meters deep. Shallower lakes are less than 50 centimeters (20 inches) deep. The depth of Lake Mackay is uncertain, but is thought to be somewhere between the two extremes. Water can persist in Lake Mackay for at least six months after a flood; when it does, the ephemeral lake provides an important habitat and breeding area for shorebirds and waterbirds. For example, researchers spotted at least 4,400 young banded stilts during an aerial survey of the wetlands in 2001. Australian Government, Geoscience Australia, Australian Landforms and their History. Accessed December 30, 2014. Australian Government, Geoscience Australia, Largest Waterbodies. Accessed December 30, 2014. Dietz, R.D. et al., (2003, April) Formation and Organization of Australian Athalassic Salt Lakes. Accessed December 30, 2014. Duguid, A. et al., (2005) Wetlands in the arid Northern Territory. Accessed December 30, 2014. NASA Earth Observatory: Natural Hazards Floods in Australia. Accessed December 30, 2014. NASA Jet Propulsion Laboratory Lake Mackay, Australia. Accessed December 30, 2014. Northern Territory Government, Sites of Conservation Significance, Lake Mackay. Accessed December 30, 2014.